In Dallas, TX we met with Dean Wendt a professional Voice over actor, who is very picky about his sound quality. he had tested any and all voice over gadget that exists, so when he says something – it is an honest opinion of someone in the know. We also discussed some other gadgets i made for Dean. This entry was posted in Voice Over MObile recording studio in Action! 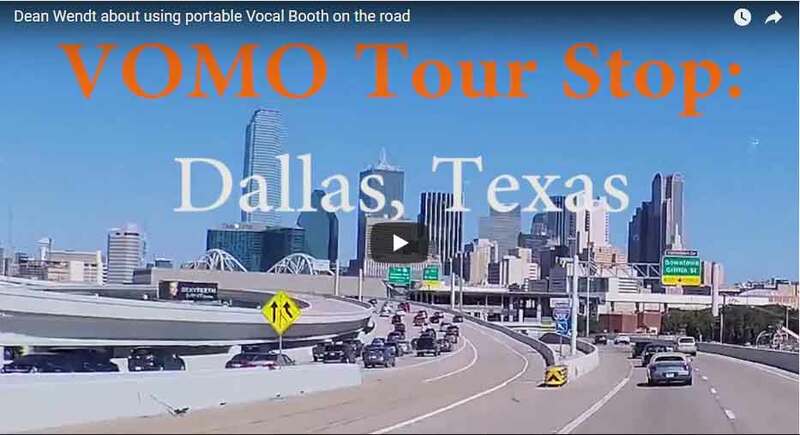 VOMO Tour Videos. and tagged acoustic room treatment, audio recording, Carry-on vocal booth, Most efficient portable vocal booth, portable vocal booth, sound booth, vocal booth, Vocal booth portable, voice acting, voice over, voice over recording while travelling, voice over sound quality, voice over travel, VOMO tour.